This easy shrimp dinnner with okra and tomatoes was inspired by Shrimp Creole, a popular dish in New Orleans. It has Spanish and French origins but has been adapted over the years with influence from Africa and beyond. My husband DJ grew up in New Orleans and has such a love for Creole and Cajun cooking, so I occasionally attempt. I never liked okra because as you well know, it can be slimy. In applications like stews or braises that very aspect can help thicken the sauce without the need for additional thickeners or carbohydrates. Reduce the sauce as much or little as you’d like until you’ve reached the desired consistency. Heat a large heavy pot over medium heat. Add bacon, sauté for 5 minutes until cooked through and rendered. Pour off some of the oil then add onion, celery, bell pepper and garlic paste. Cook until softened, about 5 minutes. Add tomatoes, okra, stock, seasoning and paprika then simmer for 15-20 minutes until flavors meld and liquid is slightly reduced. The okra would have thickened the sauce slightly. Add shrimp and cook for 4-5 minutes until they are pink and cooked through. Remove from heat, add hot sauce and chives. Serve over rice, cauliflower mash or enjoy as is. This post is sponsored by Belgioioso and FeedFeed. Where does the time go my dear? My mother used to say that at the end of every single Summer. We had spent the warmest days of the year enjoying lengthy outdoor dinners, eating fruit harvested just a mile away and listening to crickets awake after their slumber. We held on to what Summer brought for as long as we could until it was time to polish our school shoes, put up the outdoor seating and prepare as all routine returned back to normal once again. Aaah, Summer is always a dream, isn't it? To this day, I spend the last week of August gathering as much Summer produce as I can to preserve and cook with. BelGioioso as a company was started in 1979 when founder Errico Auricchio moved to Wisconsin from Italy with his family and started making the cheese he grew up eating. The company grew and now offers over 25 varieties of specialty cheese to the U.S market and counting. I love family companies so much, tradition and recipes passed down from one generation to the next - What a legacy to leave and what a way to continue the traditions of one's home country. As an immigrant to this country myself it really resonates with me. Heritage is everything and it shows in their products - I've always found their cheese to be so fresh and truly, you can taste the love. That's exactly how I feel about simple food prepared with intention. It doesn't have to be complex to be delicious, and it doesn't have to take a long time to prepare. This recipe is perfect for those weeknights where you're short on time and uses up some of those Summer tomatoes you still have on the counter :) I did not include a recipe for marinara because we all have our favorite, jarred keto-friendly marinara works perfectly here. Else, roast some tomatoes and garlic then blend it with some olive oil. I used one of BelGioioso’s freshly sliced cheese logs, which I always have on hand to save time. They are wonderful marinated and eaten as is or used in caprese salads, sandwiches and so on. But you already knew that! Click here for official giveaway rules on how you could win a BelGioioso Cheese prize box and some awesome Le Creuset pieces, perfect for your next gathering! Season BelGioioso Fresh Mozzarella with oregano, basil and red pepper flakes and drizzle with ¼ cup olive oil. Set aside to marinate. Heat a large ovenproof skillet to medium-high and add remaining olive oil. 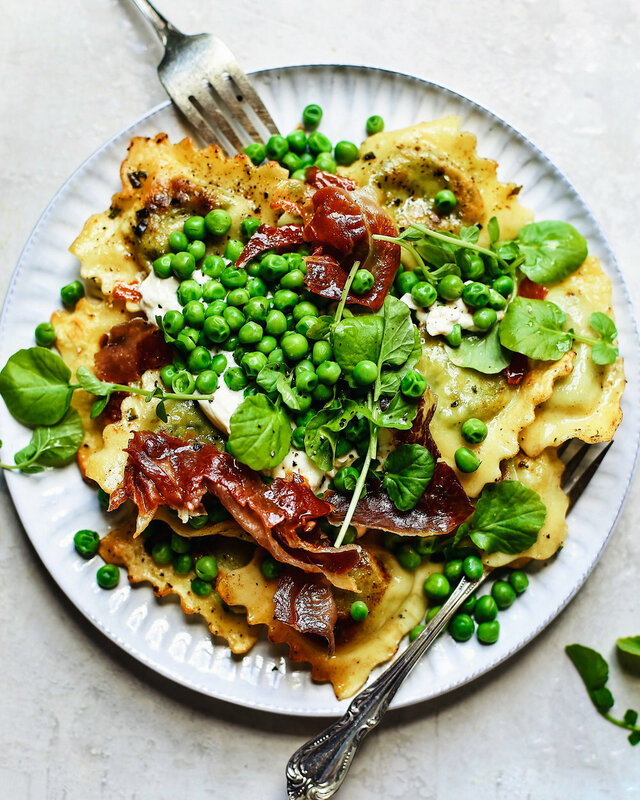 In a shallow bowl, whisk almond flour and BelGioioso Grated Parmesan with a fork to combine. Season chicken on both sides with salt and pepper, then dip in beaten egg mixture and dredge with almond flour cheese mixture. Shallow fry for 2-3 minutes per side and remove chicken. 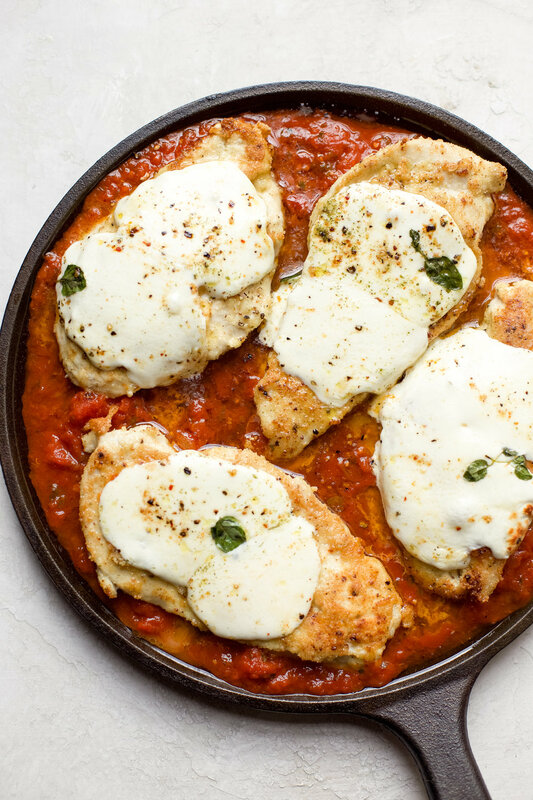 Add marinara (I love making my own and freezing, then using in dishes like this) to skillet and place the chicken on top, followed by the marinated BelGioioso Fresh Mozzarella slices. The reason why I do this instead of the traditional method of pouring the sauce on top is because I like to keep the top crispy. Please change this up if you’d like. Broil for 5 minutes in the oven until the cheese is melted and bubbling and chicken registers 165F when using a thermometer. 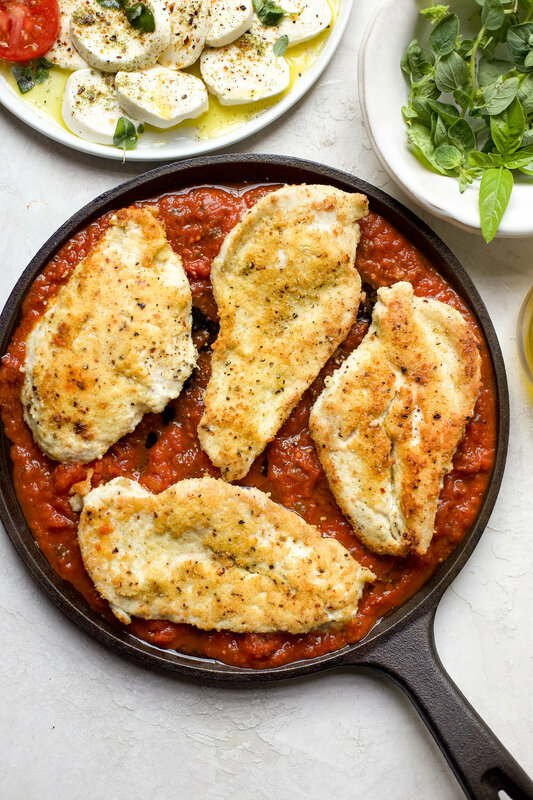 Remove skillet from oven and top with fresh tomato slices, followed by fresh oregano and cracked pepper. Serve immediately - Delicious on top of zucchini noodles! Keep scrolling for a few step-by-step images. When dredging the chicken, sometimes I omit the egg and it works very well. A great way to reduce some of the calories. This post is sponsored by BelGioioso and FeedFeed but all opinions are my own, thank you for supporting the brands that support The Daley Plate.